What’s driving current mortgage rates? 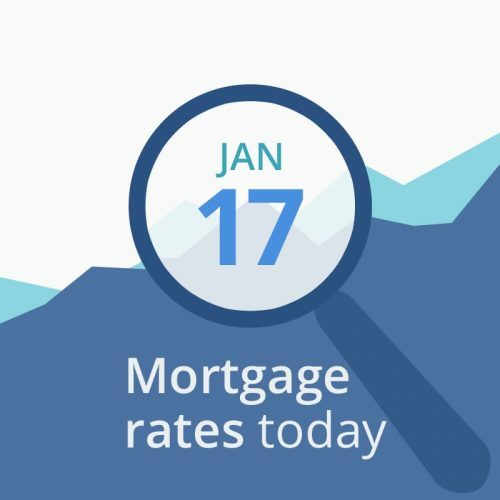 Average mortgage rates today opened with mixed results. The only pertinent economic report this morning is Housing Starts (predicted no change at 1.256 million / year rate), and because of the shutdown, it, like yesterday’s Retail Sales report, was not released. This limbo has infected the market and made investors and lenders rather nervous. Your rate might be different. Click here for a personalized rate quote. See our rate assumptions here. This morning’s opening data are little changed from yesterday’s. CNNMoney’s Fear & Greed Index is unchanged at a reading of 42 (out of a possible 100). That score is in the “fear” range. However, the direction of movement is neutral for rates. “Greedy” investors push bond prices down (and interest rates up) as they leave the bond market and move into stocks, while “fearful” investors do the opposite. There is little happening in financial markets right now. You can probably afford to float a day or two if it will get you into a better tier — for example, a 15-day lock usually has a .125 percent lower rate than a 30-day lock. But if rates are in your strike zone and you need to close quickly, grab your rate. In a rising rate environment, the decision to lock or float becomes complicated. Obviously, if you know rates are rising, you want to lock in as soon as possible. However, the longer your lock, the higher your upfront costs. If you are weeks away from closing on your mortgage, that’s something to consider. On the flip side, if a higher rate would wipe out your mortgage approval, you’ll probably want to lock in even if it costs more. This week is light on economic releases, and mortgage rates will likely move based on political happenings, such as the ongoing government shutdown, a trade war with China, and negotiations with Congress over the federal budget and the proposed border wall. What causes rates to rise and fall? Mortgage interest rates depend on a great deal on the expectations of investors. Good economic news tends to be bad for interest rates because an active economy raises concerns about inflation. Inflation causes fixed-income investments like bonds to lose value, and that causes their yields (another way of saying interest rates) to increase. For example, suppose that two years ago, you bought a $1,000 bond paying five percent interest ($50) each year. (This is called its “coupon rate.”) That’s a pretty good rate today, so lots of investors want to buy it from you. You sell your $1,000 bond for $1,200. The buyer gets the same $50 a year in interest that you were getting. However, because he paid more for the bond, his interest rate is now five percent. The buyer gets an interest rate, or yield, of only 4.2 percent. And that’s why, when demand for bonds increases and bond prices go up, interest rates go down. However, when the economy heats up, the potential for inflation makes bonds less appealing. With fewer people wanting to buy bonds, their prices decrease, and then interest rates go up. The buyer’s interest rate is now slightly more than seven percent. Interest rates and yields are not mysterious. You calculate them with simple math. The Mortgage Reports receives rates based on selected criteria from multiple lending partners each day. We arrive at an average rate and APR for each loan type to display in our chart. Because we average an array of rates, it gives you a better idea of what you might find in the marketplace. Furthermore, we average rates for the same loan types. For example, FHA fixed with FHA fixed. The end result is a good snapshot of daily rates and how they change over time.